I honestly didn't know what to expect when I finally sat down to watch Housebound, the new film from New Zealand concerning a young woman under house arrest due to a crime she commits during the opening moments of the film. I was expecting something kooky and light...instead, what I got was something smart and dark. Let's talk...Housebound...shall we? 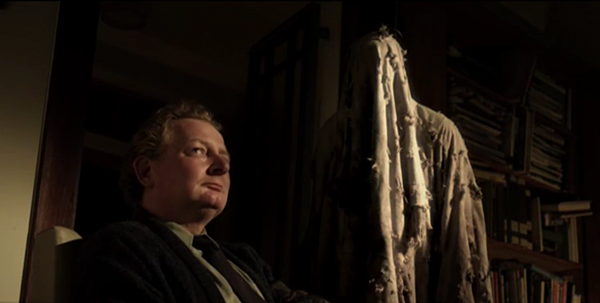 Writer/director Gerard Johnstone has crafted such an effective cinematic experience with Housebound. Considering that this is his very first feature, he does very well with pacing and storytelling with a particular sub genre where other more seasoned filmmakers sometimes fail to find their footing. There's a certain sense of creepiness when things actually start happening in the film and Johnstone does fine work of balancing those elements with the comedic beats that adds a certain levity to the viewing adventure. 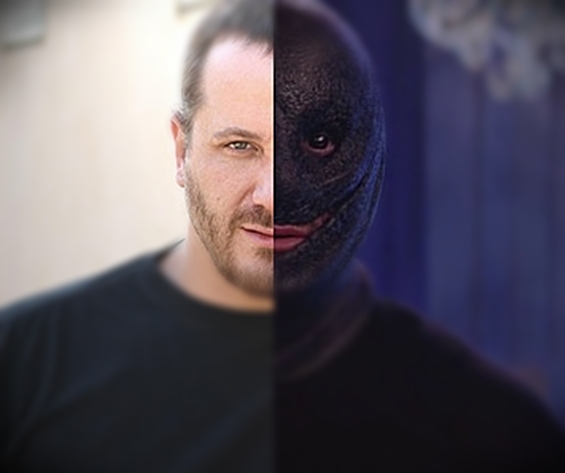 The premise is reminiscent of the 2007 film Disturbia, in which Shia Labeouf's character is placed under house arrest after punching out his douchebag Spanish teacher and he unravels a mysterious serial killer's plot to, well...kill. Here, however, Kylie (a cold Morgana O'Reilly) is forced to undergo a house arrest stint after attempting to rob an ATM and unravels much more than a serial killer's plot to, well...kill. You see...what if the house that you are forced to occupy during lock down is also occupied by a malevolent supernatural force and you cannot leave? Pretty scary, huh? Thankfully, Kylie is aided by her mom (Rima Te Wiata), her mom's boyfriend Graeme (Glen-Paul Waru) and Kylie's house arrest officer Amos (a fun Ross Harper) in solving this mystery. 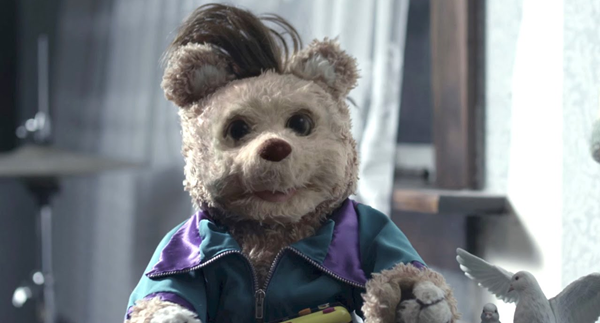 Also...there's a scary talking bear. Unfortunately, I cannot reveal too much more of the plot for fear of spoiling the film. 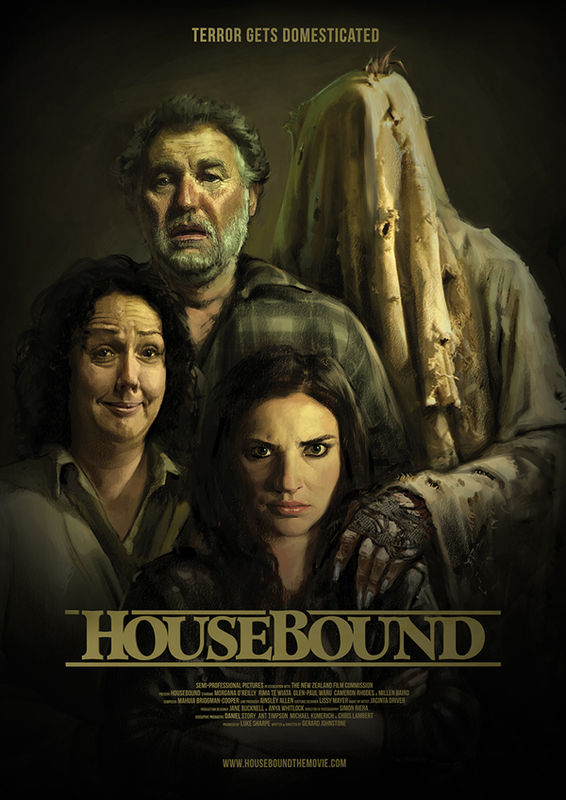 But, I will say that Housebound certainly twists into different directions that you might not see coming. For me, I kind of figured it out after a certain reveal midway through. But, that's just me. I'm the kid that took the fun out of Christmas, discovering what I got days before I opened them. There's fun to be had regardless and Housebound is chockful of truly scary moments and tension-filled sequences. It is a film that finds its beat early on and continues down its own path, allowing the viewer to come along and experience all the thrills it has in store. Usually, in a film like this...the performances are what make or break the film and just about the entire cast here is great. Even when things turn into a murder mystery, the bit where Kylie and Amos put on their spy binoculars and do their best to uncover the details ends up being much more fun than it should have been. Mostly due to the chemistry that the characters build throughout the running time. Believe me...things could have been a lot more groan-inducing. But, the performances are what made the difference here. Hell, the antagonist is so good...you end up genuinely hating him. In the way of flaws...I would only say that the entire premise does feel a little derivative. Especially when you take the previously mentioned Disturbia into consideration. Personally, I would have liked the film more if it stayed the course with its original intent and didn't turn into what it ultimately turns into (God it's so hard writing about this film without any spoilers!). But, that's not to say that Housebound is a bad film in any way. It just could have propelled it into something much more memorable. Also...I'd like to see the shorter version of this film. The one that I watched clocked in at just under two and a half hours and I felt it. In the end, Housebound is pretty much as good as everyone is proclaiming it to be. It's just the right amount of fun and scary to give you a great cinematic experience. One that you won't see coming. The film is full of something not seen in a lot of genre films today...heart. My Deviant hat goes off to the Kiwi's for building a formidable genre presence with their recent releases.